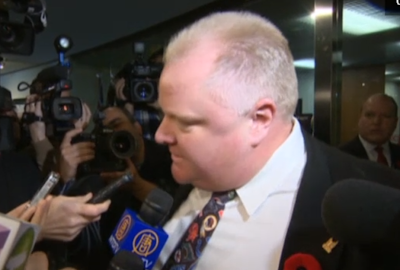 Rob Ford admitted today that he has smoked crack cocaine. Recently the Toronto Police Department has said that it has video of the embattled Mayor of Toronto smoking crack. The video has not been made public yet and Mr. Ford who is calling for its release has stated he's not seen it either. During the 0:19 to 0:21 segment of the above video Mr. Ford displays a distinct body language movement known as the "Head Torque". The head torque is comprised of a turning and rotating away with the head and neck with a subsequent turning back toward the person being addressed - leading with the top of the head first. This nonverbal dynamic has a distinct twisting or torqueing motion associated with it (hence the name) - and reminds some people of a dog or horse pushing and object with their head. A head torque nonverbal has distinct adamant, alpha, frustrated, and mild-to-moderate anger emotional components associated with it - in addition to saying, "I'm going to do what I have to do" or "I'm going to 'take my medicine' " emotion message to it. What other valuable nonverbal displays do you see in this video?